What’s the first step on the road to holiness? Now, let’s get this often misunderstood verse clear. Being poor in spirit doesn’t mean actually being destitute. Rather, it means having the attitude of one who is poor and utterly dependent on God for everything, even if one is well-off. The poor in spirit, even if they are wealthy, believe everything comes from God, and thank Him for all they are and have, from the first breath as a newborn infant to one’s upbringing, learning, work, and family. Why is this the first step toward holiness? Because it opens the door and lays the foundation for closeness, devotion and obedience to the Lord. If one depends on God and thanks Him for everything, one would also be eager to know and do His will and not misuse His bounties. Finding God’s providence and grace in everything, and constantly worshipping, thanking, praying, hoping, and employing every gift from Him for His will — that’s holy. Now, poverty in spirit doesn’t mean having nothing to do with wealth, power, and knowledge. Rather, it means using such bounties from God for His Kingdom. Hence, there are saints among monarchs endowed with riches and authority. Ever heard the Christmas carol, “Good King Wenceslaus”? It’s about Saint Wenceslaus, ruler of Bohemia, now part of the Czech Republic. Some other monarch-saints are Louis IX of France, Stephen I of Hungary, Leopold III of Austria, and Jadwiga of Poland. These holy sovereigns saw God’s grace and will in the power and riches at their disposal, offering all for His Kingdom, instead of proudly ascribing such bounty to themselves and doing with it what they please. And we emulate these saintly monarchs when we use the influence, instruments, institutions, and intelligence in our hands to establish God’s rule and will in our areas of life and action. It’s also truthful to be poor in spirit, and acknowledge our total dependence on God. Yet even the most successful, rich, powerful, learned, and talented person cannot claim that he or she climbed to that pinnacle by themselves. After all, everyone began as a helpless soul needing nurturing in a mother’s womb, even the Son of God. Hence, it is just plain honesty to affirm that we owe others, including God, our being, life, growth, and gains. And if we need proof of this truth, imagine how things would be if we suddenly fell ill and lost use of our faculties. Now, dependence on God doesn’t mean doing nothing to obtain what we need and want, for inaction closes the door to His bounty. A student who doesn’t study, blocks the Lord from helping him pass or excel. On the other hand, just because we harness human industry, ingenuity, inventions and institutions, doesn’t mean the Lord did not provide. God graces our efforts, as He did with Moses in liberating the Israelites from Egypt. And He became man to save the world with Mary’s cooperation. Quite simply, without God, no deliverance, and indeed, no creation, whether in six days or 6 billion years. Ditto everybody’s birth, growth, and achievements. While life follows earthly rules and ways, the faithful believe God spurs and sustains every direction and development, even the ordinary course of events. In our modern time, however, more and more people see nothing to thank heaven for. Instead, we credit wealth, knowledge, power, science and technology for our good life, health, success, comfort, and happiness. Until misfortune strikes. Nothing new: Pope Emeritus Benedict XVI, one of our greatest theologians, said the story of Adam and Eve showed how men try to be like God by their own devices, even breaking His commandments, until the wages of sin leads back to faith. Today, amazing gadgets and secular society tempt believers to ignore God and thank His providence less or never. Many families don’t even pray at meals anymore. And when God is no longer thanked, then His worship, word and will are also forgotten. Thankfully, the Philippines remains faithful. A 2012 global survey by the University of Chicago, “Beliefs about God Across Time and Countries,” counted 94 percent of Filipinos expressing strong and constant faith in God — the highest in the world. This Christmas and the coming year, let thankfulness toward the Lord be a constant in our daily life, at meals and mass, work and leisure; for material and spiritual needs, and everyone and everything we treasure and encounter. Even hardship, which should make us stronger, more caring, and much closer to and trusting in God. And when others disdain our faith and thanks for the Lord, hold fast. It’s humble, honest and holy. Amen. Boxing champion Manny Pacquiao kneels to Him at every fight. Golden State Warriors superstar Steph Curry points to Him after making three-point shots. Award-winning movie and pop stars include Him in their thank-you speeches. And three out of every five Americans said thanks to Him on Thanksgiving Day three weeks ago. Then there’s Davao City church worker Dennis Larida, who lost his wife and his son to a terrorist bombing on Sept. 2, which killed 15. For countless people in all sorts of situations, God provides some need or want. Life and sustenance. Family and friends. Health and wealth. Talent and success. And the strength, purpose and hope to bear pain and tragedy. How about you? What do you need from God? If you have to think hard about your answer, maybe you feel you don’t need much from Him, like the rich guy who Jesus warned would find it harder to reach heaven than a camel going through the eye of a needle. Those who don’t need God, have no reason to pray, thank, obey or even believe. And that keeps them from becoming holy. So as you start your day every morning and before retiring at night, spare a thought and a thank you for He Who gives you every waking minute, and every slumbering second, too. That brings you so much closer to Him and His heaven. 2. 1:18 This is how Christ came to be born. His mother Mary was betrothed to Joseph; but before they came to live together she was found to be with child through the Holy Spirit. 3. 1:19 Her husband Joseph, being an upright man and wanting to spare her grace, decided to divorce her informally. 4. 1:20 He had made up his mind to do this when suddenly and angel of the LOrd appeared to him in a dream and said "Joseph son of David, do not be afraid to take Mary home as your wife, because she has conceived what is in her by the Holy Spirit. 6. 2:13 After they had left, suddenly the angel of the Lord appeared to Joseph in a dream and said, "Get up, take the child and his mother with you, and escape into Egypt, and stay there until I tell you, because Herod intends to search for the child and do away with him." 7. 2:14 So Joseph got up and, taking the child and his mother with him, left that night for Egypt. 8. 2:19 After Heod's death, suddenly the angel of the Lord appeared in a dream to Joseph in Egypt. 9. 2:21 So joseph got up and, taking the child and his mother with him, went back to the land of Israel. 12. 2:16 So they hurried away and found Mary and Joseph, and the baby lying in the Manger. 13. 3:23 When He began, Jesus was about thirty years old, being the son, as it was thought, of Joseph, son of Heli,. SOMETIMES we make things more complicated than they should be. Long debates over dos and don’ts when the Golden Rule would do. Theological treatises and philosophical papers on divine love, instead of one picture of a flaming, wounded heart ringed with thorns. Powerpoint presentations and thick project reports on cash transfers, yet the poor feel government caring far more with one presidential lunch in Tondo. Sure, there are complicated moral situations that need more than just the Ten Commandments to resolve. But for most of us in everyday life, simple is best. So it was good to hear the simple steps to goodness from a couple of recent mass homilies by Fr. Alex Magtibay, of the Oblates of Saint Joseph, parish priest of Santuario de San Jose, in Greenhills, to wit: Obey. Pray. Serve. Bring God to your life. Stay apart from the world. Serve with charity and sacrifice. Let’s start with the last three steps first. Fr. Alex listed them in his sermon at the June 27 mass on the feast of St. Josemaria Escriva, founder of Opus Dei, the religious order that promotes holiness in everyday life by doing ordinary things with great love and devotion. That’s just like the two holy people in St. Josemaria’s name, Joseph and Mary. Their family life with Jesus in Nazareth was filled with simple, ordinary things to do with great love and devotion, from daily chores and meals, to conversation, recreation, and prayer. 1. Bring God into every bit of your life. A sister, brother, mother, father, grandma or grandpa is called to be holy as they are where they are. Same with a farmer, a lawyer, a doctor, a soldier, a janitor, a teacher, a student, and any other occupation. To be holy we just have to do our job and live our state in life with the same devotion to God, obedience to His will, and caring for others that His Son Jesus showed in His 33 years with us. 2. Resist the lures of the world. While we are in the world, our Lord said, we are not “of the world,” consumed by its creature comforts and cravings. This detachment is another tenet cited by Fr. Alex in his homily on St. Josemaria. Besides avoiding sinful pleasures, detachment also means living simply so we can give more to others. Live simply so that others may simply live, as Fr. Alex put it, quoting Mahatma Gandhi. The simple life is also part of being poor in spirit, the first of the Beatitudes, thanking and depending on God for everything we have. Since all things come from Him, we do not waste anything or use it for our own selfish ends. Rather, everything is offered to Him for the building of His kingdom on earth. 3. Serve others with charity in our hearts. Besides bringing God into our life and keeping the world at arm’s length, Fr. Alex cited a third essential ingredient of holiness: love. “Many people do acts of charity without charity in their hearts,” he pointed out. We may do good just to fulfill an obligation. Or worse: many just show off to impress others with their outward goodness, which then becomes an act of pride and pretense. Above all else, there must be love for God and our fellowmen in all that we think, say and do. After all, God’s two great commandments are to love Him with all our mind, heart and strength, and to love our neighbor as ourselves. And how do we enliven this love for our Lord and our brethren? 4. Obey, pray and serve. In his homily for Pentecost Sunday, Fr. Alex distilled what we must do to show our love for God: obey, pray and serve. That means not just obedience, but praying to God and serving Him in our less fortunate brethren. To do God’s will, we must listen to Him in prayer and scripture, both in private prayer and Bible reading, and most especially at the Holy Sacrifice of the Mass. Prayer also gives us the graces to persevere in goodness, avoid sin, and grow in faith, hope and love. And in service to others, we fulfill Jesus’s wish for us to love one another as He has loved us, and to serve Him in our needy sisters and brothers. If we do all this, then not just our lives, but our souls will be lifted to the holiness of God. That is Jesus’s promise in the same Gospel of John (Jn 14:23). Of course, as we said in the beginning, one example is far better than so much talk, including the 800-something words you just read. 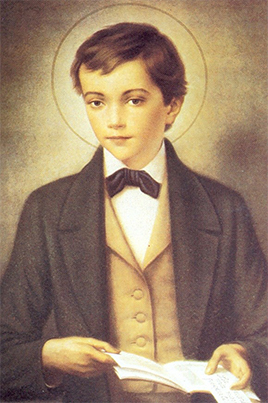 Take one day in the life of child saint Dominic Savio. At age 11, the Italian boy was falsely accused by a wayward classmate of a serious offense that the latter had actually committed. Dominic quietly bowed and accepted his teacher’s scolding and punishment. In short, Dominic wanted to do as Jesus did. Holiness. It’s that simple. Amen.